BRITAIN is keen to assist Zimbabwe to identify resources to compensate former white commercial farmers who lost farms during the land reform programme, an issue that triggered the stand-off between Harare and London at the turn of the millennium. This emerged during a meeting between Foreign Affairs and International Trade Minister Retired Lieutenant-General Dr Sibusiso Moyo and British Minister for Africa Mrs Harriet Baldwin here yesterday. Briefing The Herald after the closed door meeting, Ambassador Chitsaka Chipaziwa said Mrs Baldwin restated the importance of the invitation extended to Lt-Gen (Rtd) Dr Moyo saying it should herald serious reciprocal visits between Harare and London. 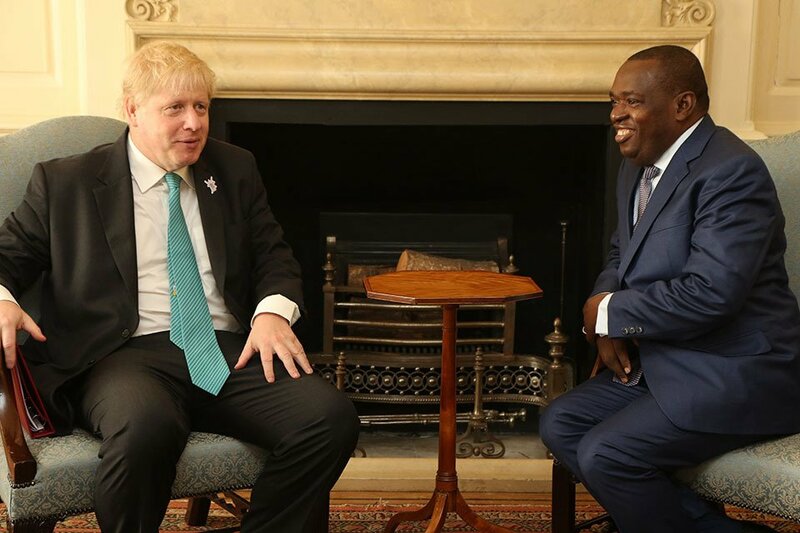 Dr Moyo is here at the invitation of British Secretary of State Mr Boris Johnson with whom he held a highly cordial meeting last Friday. ‘‘She went over the issue of restating how very important it is that our minister is here and that this is the commencement of serious exchange visits between the two governments. That the United Kingdom will continue to work with Zimbabwe in the Lima process, and that the UK government would assist the Zimbabwe Government to identify resources to compensate the former commercial farmers who lost farms in the land reform programme,’’ Ambassador Chipaziwa said. The British government, he added, underscored the importance of free and fair elections in Zimbabwe, saying London would put in a good word for Zimbabwe in the ears of the major players in the international community. ‘‘Both countries said they were not going to be restricted by the past but were very much interested in the future, and the £100 million per annum DFID assistance programme will continue into the future. The United Kingdom will also join other EU countries in coming to observe Zimbabwe’s elections,’’ Ambassador Chipaziwa said. In response, Dr Moyo thanked Mrs Baldwin for attending the 38th independence celebrations held at the Zimbabwe Mission here on April 18 which she described as ‘‘a fantastic party’’. ‘‘The minister said he felt the warmth of the British people and that on the 20th of April, (British) Foreign Secretary Boris Johnson hosted a breakfast event with 11 other Commonwealth foreign ministers who all, without exception, encouraged Zimbabwe to rejoin the Commonwealth for Zimbabwe has an illustrious history in that organisation,’’ he added. Dr Moyo, Ambassador Chipaziwa said, announced that Zimbabwe would follow the steps necessary to rejoin the Commonwealth after appropriate preparations as he thanked the British government for the positive role played by the UK delegation at the Spring Bretton Woods institutions’ meetings last week when they helped Zimbabwe to re-launch the Lima process to address Zimbabwe’s debt arrears. From Whitehall, Minister Moyo met Commonwealth political adviser Governance and Peace Directorate Ms Linford Andrews whom he apprised of political developments in Zimbabwe, particularly preparations for harmonised elections set to be held by July 31 this year and Zimbabwe’s intention to rejoin the Commonwealth. Ms Andrews said when Zimbabwe left the organisation, all member states were agreed that should it reconsider the decision, it would be welcomed with open arms. Minister Moyo gave Ms Andrews a letter inviting the Commonwealth to send a team to observe the coming elections saying all boxes were being ticked towards Zimbabwe’s rejoining. Ms Andrews said while it was not the practice for the Commonwealth to observe elections in non-member states, the organisation would send a team once Zimbabwe made a formal expression of interest towards rejoining the councils of the Commonwealth.